Preheat oven to 375, melt chocolate chips, set aside. Beat butter and sugar until creamy. Add egg and vanilla. 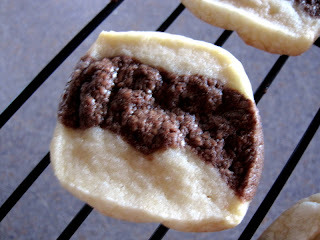 Separate dough into 1/3 and 2/3, mix in melted chocolate until 2/3 is fully blended. Press half of 2/3 chocolate dough into 9x5 loaf pan lined with wax paper. 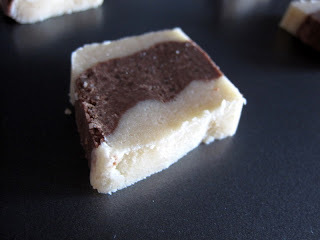 Press plain dough over 1st chocolate layer, then cover 2nd layer with remaining chocolate dough. 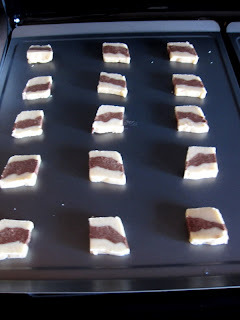 Cut dough in half lengthwise, slice into 1/4" slices and bake on ungreased cookie sheets at 375 for 7-8min.